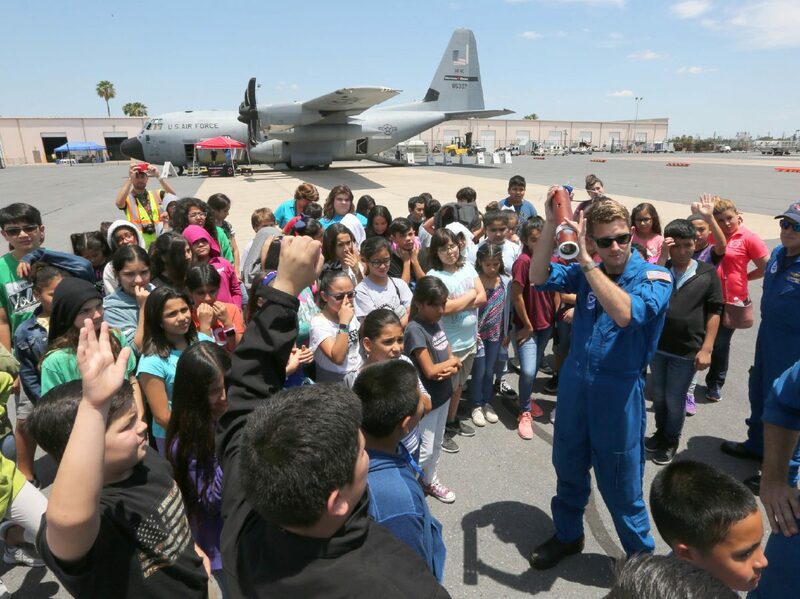 National Oceanic Atmospheric Administration's Nick Underwood, right, holds up a device used to measure hurricane winds after it is dropped from an airplane while talking to students from Wilson Elementary on Monday, May 7, 2018, at the McAllen-Miller International Airport in McAllen. Students and members of the pubic toured NOAA's and the US. Air Force's planes used in hurricanes and learned how to prepare for the upcoming storm season. While there’s nothing that can be done to prevent a natural disaster, one can always be prepared. The National Oceanic Atmospheric Administration chose the McAllen International Airport as one of the two Texas locations to host a public hurricane awareness tour in honor of National Hurricane Preparedness week. Each year, the NOAA visits coastal and inland cities in the weeks leading up to hurricane season, which begins June 1. Representatives from NOAA and National Weather Service of Brownsville on Monday shielded themselves from the sun in aviators and set up displays to educate visitors on how to prepare, as well as where to find assistance, during a weather-related emergency. Other local and regional crisis response agencies in attendance included the Weslaco Fire Department, Salvation Army and the American Red Cross. The Air Force Reserve C-130J—one of the 12 aircrafts in the world permissible for flight during a thunderstorm— was flown down for the tour. Weighing 90,000 pounds when empty, the “Hurricane Hunter” flies up to 40,000 feet to gauge the weather. Families and groups of friends snapped photos in, and asked questions about, the aircraft. Air force Lt. Col. Jeffrey Ragusa explained the operations. To obtain a profile of the atmosphere, a cylinder is extended to take the temperature, humidity and other parameters involved. Since becoming a pilot in 2002, Ragusa said he has flown through Category 5 (the highest on the scale) hurricanes. Without taking such risks, the public would not receive weather alerts from the National Hurricane Center. Leave the notifications on, he urged. Bus driver Juan Ozuna spent his day “bringing and taking and bringing and taking” attendees from the parking lot on the opposite side of the expressway to the airport’s cargo building. McAllen High School and IB student Emily Gurwitz, 17, who is “interested in severe weather” and plans on becoming an atmospheric scientist, boarded one of the last available shuttles after school to learn about natural disasters and speak with experts in the field. According to Gurwitz, one of her teachers recommended she attend due to her known interest in tracking hurricanes. NOAA Director Ken Graham noted children were particularly inquisitive. “So many future scientists have come though here and have asked how to become meteorologists, climatologists, hydrologists,” Graham said. Nearly 100 students from McAllen ISD were bussed to the site for the educational opportunity. Used namely for hurricane forecasting and research, the Gulfstream IV was another of the NOAA’s visiting aircrafts present for touring. Although hurricane season begins next month, Graham encouraged preparedness be considered yearlong. It is recommended to keep an emergency supply kit containing several days worth of food and water. For more information on available resources and plans, visit weather.gov/rgv.